An electromechanical switch made primarily for routing microwave signals/RF energy from one point to another within a transmission line. Coaxial RF switches can be used in either an industrial environment or in the lab. These electromechanical devices are also used for RF testing equipment and in large RF communication systems and networks. Coaxial switches vary by port configuration, switch type, maximum frequency, isolation, insertion loss, voltage standing wave ratio (VSWR) and package type. 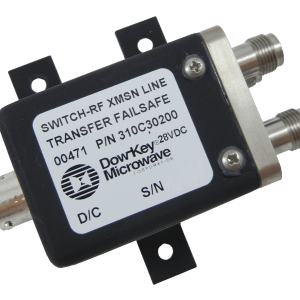 Coaxial RF switches are able to route RF signals over a broad bandwidth from DC to 40 GHz, and are now offered with the Low PIM option which will improve Passive Inter modulation levels from -110dBc (standard switch) to -160dBc. Search Our Complete Line of Products – Call 805-650-0260 with any questions.